Earn $1.79 in VIP credit (179 points)What's This? 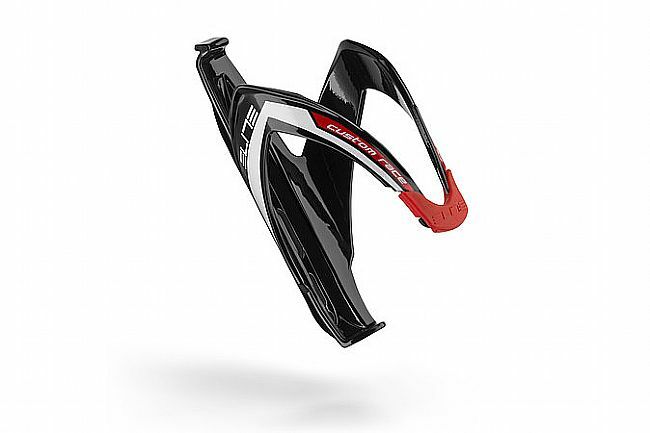 The Elite Custom Race Water Bottle Cage has been proven time and again by the world's best cycling teams. It's made from fiberglass-reinforced nylon to make it strong and lightweight, and an adjustable rubber grip creates a stronger hold that's made even stronger because of its vibration damping properties. Unobtrusive styling and multiple color options are sure to make it a winner on any bike. These Elite bottle cages are great. I have lost too many water bottles out on the trail with the standard steel cages. Even when bent in for maximum grippage, bottles still seemed to weasel out on a bumpy descent. The Elites hold onto my 25oz Podium Big chills and dont let go. Perhaps not the best value on cages made of plastic and rubber, but if you can find them on sale, these are worth consideration. I have these on two bikes and they have provided years of service. Securely holds camelback bottles on rough roads. Love these water bottle cages. They look sleek. And hold my camelbak chill podium bottles (24 oz) without a problem. Grips firmly, quite a bit of effort to place bottle. Using this on my new adventure bike, so the firm grip on the water bottle is probably a good thing. These are simple plastic cages. They are reasonably lightweight and look good. They grab the bottle snugly and that's good if you're using these for MTB, riding gravel or on bumpy roads. You can spend a lot more on a bottle cage but you won't get any better functionality than these provide. The snug fit could be an issue if you are challenged at quick bottle removal and replacement but it's not a big deal. Elite bottle cages are great. They hold the bottle securely, look good and are lightweight. There are many color options so easy to find something that goes with your bike. Third set of these cages over the last 10 years. They are light, durable, and hold bottles tight even on rough terrain. Holds bottles very securely. However, if you're using Camelbak Podium bottles, they can be difficult to get in and out of the cages because of their shape. Stick with straight-sided bottles for best results. I know it's not as fancy as some of the carbon cages out there, but it's still super light and I've never lost a bottle. The price is right too, and if it's good enough for the pros it's good enough for me.